By integrating graphene based photothermo-electric detectors with micromachined silicon nitride membranes, we are able to achieve room temperature responsivities on the order of ∼7–9 V/W (at λ = 10.6 μm), with a time constant of ∼23 ms.
Of course it's not as simple as a single sheet. The team have not only used graphene for the sensor itself but use thin strips to graphene to hold and thermally isolate the sensor from the main substrate. A couple of items for your interest. Shutterbug published a lovely appreciation of Sir Simon Marsden on October 5th. I also found him very communicative and helpful at the time of the Centenary and really regret not meeting up, especially now I live a lot closer than I did in 2010. This has prompted me so that this year I've decided to desert Ansel Adams and get my 2016 calendar from the Marsden online shop. Rather oddly, considering the piece dates back to August 2014, New Scientist just tweeted a link to an edition of their 'Last Word' column, which asks 'How far beyond the visible spectrum does a rainbow extend?'. The responses discuss both UV and IR extensions of what we see, and especially how those might be more dominant on other worlds such as Titan. It reminds me of the work of Robert Greenler who, having deduced that there should be an infrared component to a terrestrial rainbow, finally succeeded in photographic a natural one in 1970. I recently had a visit from Ed Thompson and had a sneak preview of his upcoming book of colour infrared photographs. I'll write more about this when it's published but suffice to say there's lots of red and a delightful conceit in the way the book is packaged. In the meantime if you're in the vicinity of the Rough Print Gallery (14 Bradbury Street, Dalston in London) then images from the Red Forest and The Village portions of his epic Unseen project will be on show. The gallery Tumblr stream tells us that it's part of the White Rabbit Restaurant and the gallery is open 10-5 Wednesday/Thursday and during the restaurant opening hours. Starts 15th October and runs to the 21st. I think that'll do for the moment. Cuba is a fascinating place for photography, with its blend of Spanish colonial architecture, old vehicles and picturesque scenery. 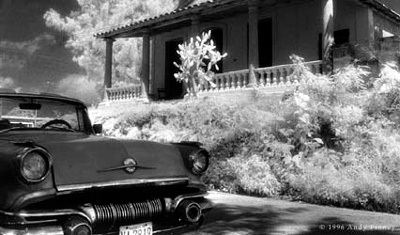 It has an infrared legacy as well, if you recall the movie Soy Cuba. I took a roll of infrared film on my trip, almost 20 years ago, although the only place I used it was in Varadero, which is not necessarily the place to go to experience the real Cuba. The shot at the top of the page is from Varadero ... in the older part of town away from the tourists on the beach. So, if you are based in the USA and fancy an infrared photographic trip before Cuba changes (which I hope it doesn't) then you could do worse that go in the company of Laurie Klein. Camera Voyages have organised the logistics, flying from Tampa, Florida and visiting Havana, Cienfuegos and Trinidad between December 3rd and December 10th. Take plenty of dollar bills (the locals may ask you for some! ), or pens or soap. Laurie will help you find unique ways to capture the feelings, sights and sounds of a culture different then ours at home, through method acting, taping into your inner creative voice and having fun. Bruce will help you capture the streets and the motion with in the frame. The culture is all around. He will help you tell the Cuban story with your camera. A recent visit to Bath included the Herschel Museum of Astronomy, which occupies a house where William Herschel and his sister Caroline lived and is also home to the William Herschel Society. This isn't the location of his famous discovery of infrared radiation (by then he had moved to Slough) but it is from where he first observed the planet Uranus in March 1781. If you're in Bath I recommend a visit. It should give you some measure of the man and his times and will also remind you of how important a scientist his sister Caroline was as well. While there I discussed the infrared discovery with the staff and was shown a section of the Herschel Chronicles book (originally published in 1933 and now available in facsimile) which includes correspondence between Herschel and his patron Sir Joseph Banks. The Chronicle's author notes that Herschel, as was common at the time, thought radiant heat was fundamentally different to light. We now know that the two are different only in their wavelength. Banks is encouraging Herschel to use the term 'Radiant Heat' rather than Caloric, which Banks linked to the 'French system of Chemistry'. Time has proved Banks correct and Herschel was glad to take his advice, saying he was 'very ready to change the word Caloric for Radiant Heat, which expresses my meaning extremely well'. I've been hoping to have a closer look at one of the new breed of 'personal' thermal imaging cameras, and with the help of the Royal Photographic Society Journal I have been able to. 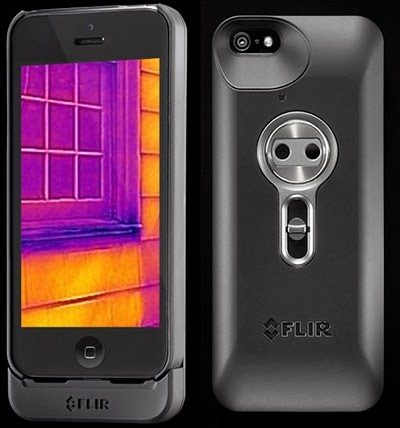 You may recall from earlier posts that this version of the FLIR One operates like a case for the iPhone 5 (more versatile versions are imminent) and uses the iPhone for viewing, operations and storage. The FLIR's case fits firmly onto the phone although it is in two parts so the thermal camera part can be easily unclipped if you don't want to carry it with you all the time. Fitting and removing the inner case to the phone is a little tricky and some users report breaking it ... so be careful. Clipped together the device is obviously heavier than the iPhone but not unduly so, and the whole thing still slips easily into a pocket. The two devices communicate via the Lightning connector and the thermal camera does not take any power from the camera; it has its own battery which is charged separately. To operate the camera you pull down a slider switch half way until it clicks and turn on the free downloaded app. You are then prompted to pull and hold the slider a bit further, to calibrate the camera, after which you're ready to go. It's point and shoot, with options to change the colour palette, hold exposure, and select either a still photo, a panorama, time-lapse or a movie to shoot. Thermal resolution is low, at 80 by 60 pixels, but the software neatly combines this with information from a coincident (almost) 640 by 480 visual camera, adding something like the Photoshop edges filter to form a hybrid image. For most purposes, this process, called MSX, completely ameliorates the low resolution thermal image. As the two cameras are not completely coincident there will be parallax errors if you shoot close-up. It is possible to correct for this (but sometimes I forgot). You can choose between several colour palettes. 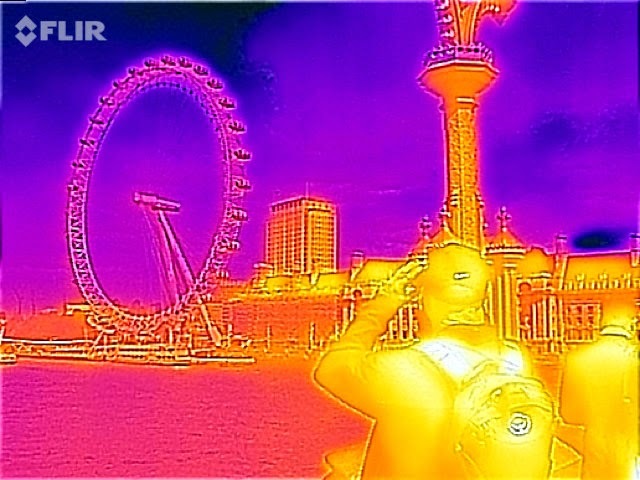 A thermal image is monochromatic but adding false colour can help show the distribution of temperatures. You can change the palette of a shot later, but for some reason the camera shrinks the image to 516 by 387 if you do this, which is weird. Another thing to note is that a FLIR logo is added to every image shot, which is slightly intrusive (imagine if Nikon or Canon did this) but is par for the course with their devices. Straight out of the box you can shoot useful diagnostic images. 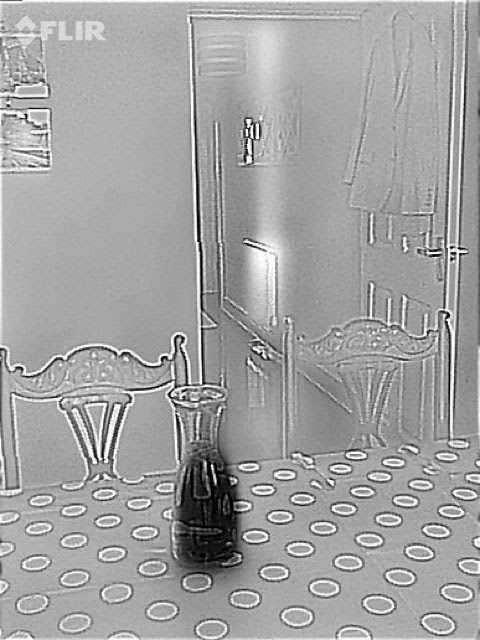 For example, here is a shot that shows a cold carafe of water in the foreground and in the distance you can see a warm radiator and also the heat trace of warm pipes going up inside the wall above it. This uses a grey palette ... dark is cold and white is hot (relatively, the range is actually 12.8 to 21.2 degrees C). Here's a shot with the temperature indicator turned on which shows heat spots of a group of transformers powering my broadband and phone equipment (iron palette). The FLIR One has a number of emissivity settings with a matte setting being the recommended one. Emissivity denotes how much infrared thermal radiation something radiates compared to what it should do if it were a theoretical 'black body'. Knowing the emissivity helps you know how accurate a remote temperature measurement is. The FLIR One has four settings for this, from matte to glossy, which is fewer that a fully professional thermal camera might have but is still useful. I've no doubt a thermal camera such as this is a useful practical tool, especially in DIY for tracing heat loss and heating pipes (amazon.com buyers are notably enthusiastic about this kind of application), but I'm not so sure about its artistic possibilities. The low thermal resolution makes it difficult to take images as atmospheric as those that Joseph Giacomin takes, especially since I couldn't work out how to record only a thermal image with no visual embellishment. 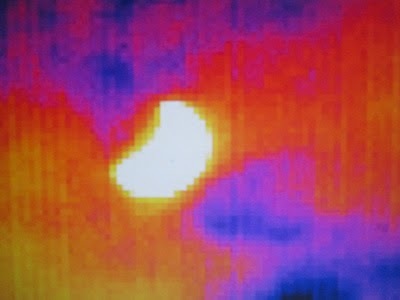 That said, it's easy to take fun thermal images and the images certainly attract attention. 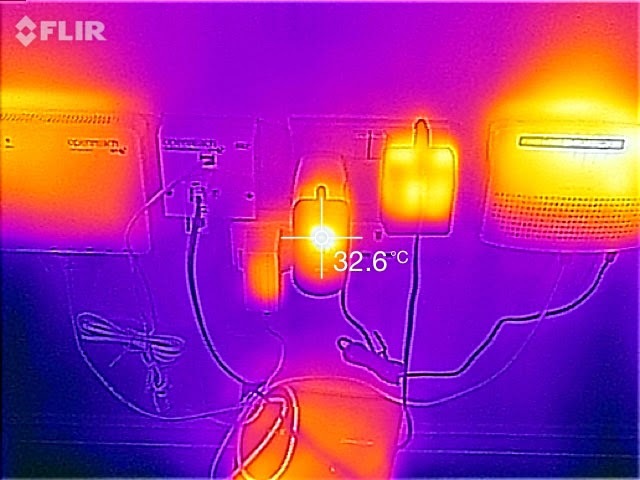 I showed the FLIR One to a visiting heating engineer who immediately said he'd ask his boss for one, although for a professional with no need for panoramas or movies the new FLIR C2 [data sheet] is likely to be a better bet, especially since it is a self-contained unit with a similar price point and better analytical features. The FLIR One in this form factor is available now from places such as the Apple store and Amazon (£180). I would wait for the newer model, which clips to the bottom of an Apple or Android phone or an iPad and should be a bit more future proof. From an artistic point of view I will pass, despite the low price. 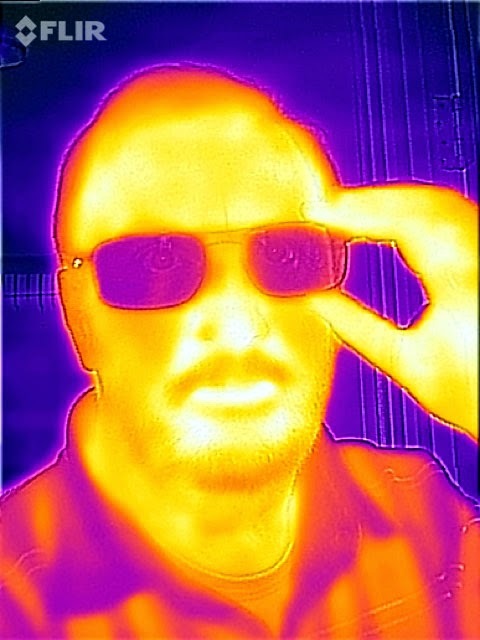 I think Joseph has convincingly demonstrated that a 640 by 480 thermal image has real artistic possibilities but I am less excited by the low resolution of the FLIR One. However this, and similar cameras, will show whether there is a market for less wallet-busting thermal cameras ... so I am delighted to see it and ignoring my arty pretensions I do think it's an impressive device and really easy to use. To finish here are a few more results I got from the camera. Click for full size (640 by 480) versions. The obligatory selfie. Normally with a thermal camera you wouldn't see my eyes through the glasses, but here the special processing does show them. The London Eye from Westminster Bridge. The thing growing out of the guy's head isn't a new tower block ... it's a lamppost on the bridge! 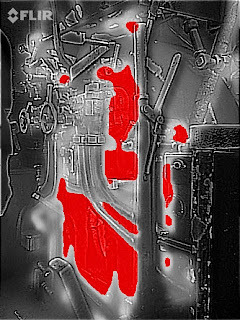 This shot, of the cab of a steam locomotive, demonstrates a colour palette that shows the very hot spots in red. And finally some movie. Shooting a movie is straightforward, although in some circumstances you should lock the exposure (called span) to avoid changes to the palette mid-shot. The three scenes are of a London tube train (Victoria line) and a subsurface line (Circle etc) ... here you can see how the tube train, which runs deep underground, shows as warmer in relation to the platform than the subsurface one, which is at pretty much the same temperature. The wheels show very hot, as the trains are braking as they come into the stations. The third scene is of a loco at the Yarwell halt on the Nene Valley Railway, running to change ends before pulling a train towards Peterborough. I was surprised to see the hotspot at the front of the loco and by how relatively cool most of it was. 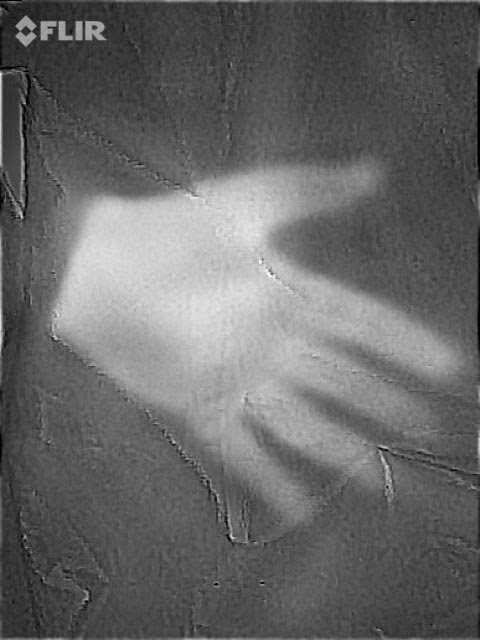 Given that near infrared can penetrate a little way into skin, there are an increasing number of interesting applications that exploit that. I noted a medical system for locating veins last November. Now a Swiss company is demonstrating a sensor that uses NIR to scan the pattern of veins on your wrist, which are apparently unique to you, to use as a biometric key. There's more on the BIOWATCH web site and also in a news item on the BBC web site. After recent problems that Apple's watch infrared sensor found with tattoos, it'd be interesting to know whether they'd cause a problem for this sensor. Presumably unless there's total coverage, there will still be some vein pattern to use. I assume there's a patent and a quick search throws up some interesting examples, such as US 6799726 B2 from 2000, which uses near-field radio in a wrist-watch to access ski lifts, and WO 1988004153 A1 from 1987, which concerns biometric sensing. As this latter patent points out, often this requires a user to carry out a special action, such as looking into something or placing a hand on something. With the advent of sensors small enough to fit onto a wristwatch strap, the sensing can be genuinely unobtrusive. Ed Thompson will be talking about his series of colour infrared photographs - Unseen - at a Photo-Forum event in London on May 14th. His talk is alongside one by Lewis Bush, another photographer with an unique vision. I wrote about Unseen last month: here and here. The Photo-Forum event is being held at Calumet in Drummond Street, starting at 1800, and you can find out more on the Photo-Forum web page. Laurie Klein, whose excellent book Photographing the Female Form with Digital Infrared I reviewed in November, will be giving a talk on infrared landscape photography at the Optic 2015 Conference early next week. The event, in locations in New York city near to the B&H store, runs from Sunday May 3rd to Tuesday May 5th. Laurie's presentation is at 11 in the morning on Monday May 4th and takes place in the Orion Room at AMC Loews 34th St Theater (4th Floor). AMC Loew's is on 312 W 34th St between 8th and 9th Avenue. The event is free but you are encouraged to register. Here's the link to the page for Laurie's presentation. I made it over to Bethnal Green yesterday to see Ed Thompson's 'Unseen' exhibition and, as I expected, found the images fascinating. There are only two days left but I do recommend that you get over to the Four Corners Gallery if you can. Ed very kindly gave me a print, and we chatted. I was impressed that he made such good use of this difficult film stock ... even more so since he found that he didn't need to bracket. 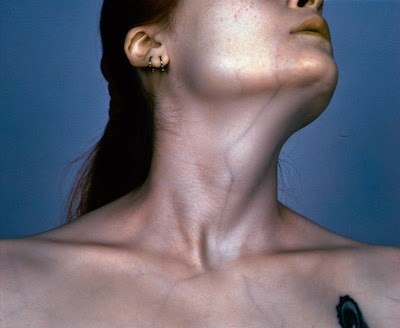 One thing that struck me was the silvery skin tone in the Vein series. I've been trying to figure out what might cause it: the illumination was flash and the images are almost always straight what was recorded on the film. I'll leave you with my favourite out of the Vein shots and a final note that Ed plans a book sometime soon. Details yet to be announced. Documentary photographer and lecturer Ed Thompson has started an exhibition of colour infrared photographs at Four Corners Gallery in east London. It's called The Unseen and is a compendium of medium format Aerochrome shots taken for several earlier projects. 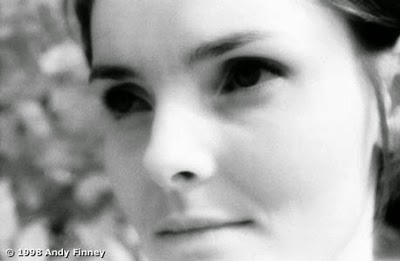 The photographs cover landscapes, medical imagery and aerial photography, in some cases echoing the original intended usage for the film, which was better known in its Infrared Ektachrome incarnation. The exhibition runs until April 18th. Like Richard Mosse, Ed Thompson's use of medium format Aerochrome film is a dying gasp for the medium. I doubt if there's much stock left now, and although it is possible to mimic the film's effect with a digital camera, the results (at least by me) are nowhere near as dramatic as 'the real thing'. 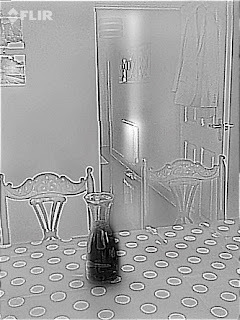 This was taken in the south west of England with a FLIR 320 by 240 pixel E320 thermal imaging camera. This camera covers a range of 7.5 to 13 µm, which includes a substantial atmospheric window around 10 µm. Prints of four of the late Sir Simon Marsden's infrared photographs are included in Sotheby's 2015 Made in Britain auction. This takes place on the morning of March 25th. 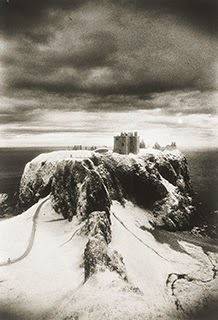 The four, in two lots, are his famous shot of Moydrum Castle in Ireland, as shown in the Infrared 100 exhibition in 2010, together with an atmospheric view of Dunnottar Castle in Scotland (above) and shots of Whitby Abbey and a gargoyle at Toddington Manor in Gloucestershire. Estimates for the two lots are both between £1,500 and £2,500. In the same auction last year there was a lot of four of his prints, which exceeded their top estimate to fetch £4,375. Like Minor White, Ansel Adams and others, Simon saw the print as (to quote Adams) 'the performance' where the negative is 'the score'. This places a great importance on the printing process, especially when the photographer does the printing (as did Simon). Whether this analogy means that no-one else can legitimately print a photographer's negatives is a difficult point, since following the musical theme it would mean that we should discount Sir John Eliot Gardiner's performances of a Beethoven symphony simply because only Beethoven himself could conduct it (other great conductors are available). But I'm just being devil's advocate ... sadly Simon will print no more and this is a chance to own the authentic manifestation of his vision. There are very few prints of Simon's work around and it's likely that there will be no more prints made. Plus, I am always delighted when people take artistic infrared photography seriously. Lot 107, Moydrum and Castles, sold for £1750 while, sadly, the other lot didn't sell. A recent article in New Scientist caught my eye. My drug-filled nanospheres heal at the speed of light reports work by a team led by Professor Adah Almutairi at the University of California, San Diego. Her work explains that by making use of near infrared's ability to penetrate skin and tissue, it is possible to use a laser of the appropriate wavelength to trigger a polymer nanotube to break down and, if it's carrying a drug, to release it. Since the light can be tightly targeted it would be possible to therefore tightly target a release site for the drug. There are other mechanisms for triggering release, such as the temperature of inflammation or even sunlight on the skin. This latter has the neat prospect of a sunscreen that activates when you get into the sun. You can see the abstract or buy the paper from ACS Publications. One interesting thing, for me, is the statement at the top of the abstract that "Near infrared (NIR) irradiation can penetrate up to 10cm deep into tissues". Admittedly, from a photographic point of view you need to remember that the IR has to penetrate the tissue and then get back out again, but I believe the figure of 'a few millimetres' has been a good rule of thumb for years. A figure of between one and two cm has been cited from a paper by Gao et al, In vivo cancer targeting and imaging with semiconductor quantum dots from 2004. So I decided to see what Lou Gibson had to say on the matter in his third edition of Clark 'Photography by Infrared' in 1978. He quotes Balderry and Ewald, in a 1924 paper called 'Life Energy in Theraputics' as saying that sunlight can penetrate up to 25 cm into the body. So that 10cm seems quite reasonable. Photographically, however, a near infrared photograph will often show veins under the skin, and will almost always give people a 5-o'clock shadow (even some women). This is also, as I've pointed out before, the cause of the alabaster look you can see in infrared portraits. I'll leave you with this image of Jude (a lady with whom I used to work) demonstrating the infrared look, with the added 'bonus' of 35mm infrared film grain. Following on from the experiment to extend human vision into the near infrared (part of my previous post) I found related papers in the Journal of the Optical Society of America and Acta Physica Polonica. The foveal sensitivity to several near-infrared laser wavelengths was measured. It was found that the eye could respond to radiation at wavelengths at least as far as 1064 nm. A continuous 1064 nm laser source appeared red, but a 1060 nm pulsed laser source appeared green, which suggests the presence of second harmonic generation in the retina. This paper is available as a PDF. During the diagnostic research done by means of optical devices equipped with radiation sources from the near infrared range the phenomena indicating the perception possibility of this range by a human eye were observed. In this contribution the initial results of the research of this phenomenon were presented. Sources of radiation applied in laser polarimeters (785 nm) and devices designed for optical coherent tomography (820, 850 nm) were taken into particular consideration. Perception tests with the use of a laser diode generating at the wavelength of 940 nm were also carried out. It was stated that the radiation from the range examined can be recorded by a human eye giving a colour sensation — in practice independently of the wavelength of the radiation beam falling into a retina. I suspect this kind of experiment with lasers falls into the don't try this at home category but it demonstrates that the usual limits quoted for human visual sensitivity are not necessarily the only ones. There's some interesting notes about this also in the Wikipedia entry on light. The final word may have to go to a paper I found in the Proceedings of the National Academy of Sciences of the United States of America (PNAS vol 111 no 50) with (sorry) too many authors to list (let's just say Palczewska et al) and with the title Human infrared vision is triggered by two-photon chromophore isomerization. Almost totally out of my area of expertise but if you have the knowledge then you can access the paper (paywall) via this link. I'll leave it to the report's authors to have the final word ... quoted from their 'significance'. This study resolves a long-standing question about the ability of humans to perceive near infrared radiation (IR) and identifies a mechanism driving human IR vision. Apologies for not posting yet this year ... but here are a few items to make up for it. Towards the end of last year I came across a claim that a special diet could extend human vision into the edge of the near infrared. Petapixel carried an explanation of the research project and also a rebuttal by a neuroscientist. The original crowd-funded experiment page is on experiment.com and the group carrying out the research is called Science for the Masses. Since last August the web seems to have gone quiet on the project. A slight increase in deep red sensitivity would be useful for astronomers wanting to view the universe at the wavelength of hydrogen-alpha: 656.28 nm. Canon produced a camera modified to give similar better response a few years back and Nikon have now also done so, although theirs is a high-resolution full-frame camera. It's the D810A. The older Canon still had some infrared filtering in place so it couldn't be used for infrared photography, but it is unclear whether this is the case with the Nikon. The press release is unclear although DP Review suggests that there is still filtering. For those of you interested in the BBC's natural history infrared shooting, there is a training film on line where Colin Jackson explains his technique. However, this his team moved on to using modified Canon DSLR cameras rather than 'pure' video cameras so the film is a little out of date.